This review is from June 2018. ‘My Name is Lucy Barton’ returns in January 2019. I have not read Elizabeth Strout’s 2016 novel ‘My Name is Lucy Barton’. 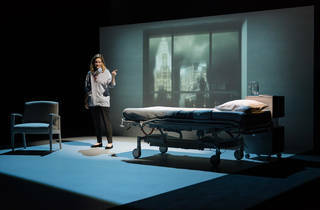 And I still find it difficult to imagine its shape from Rona Munro’s twisty, turny stage monologue adaptation that sometimes feels like an overambitious attempt at slimming down something much bigger. But at its best, it achieves a cryptic, feverish intensity. 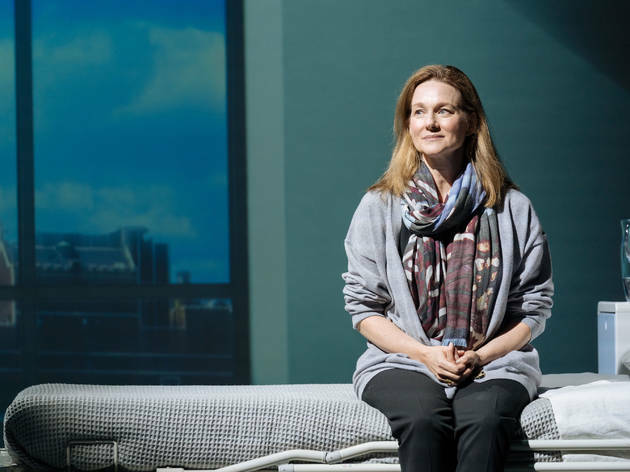 Moreover, it’s propelled by a genuinely phenomenal performance from movie star Laura Linney, who is excellent in the title role as reminiscing writer Barton. Too often visiting film actors making their London debut feel like they’re trying too hard, so desperate are they to prove their chops. 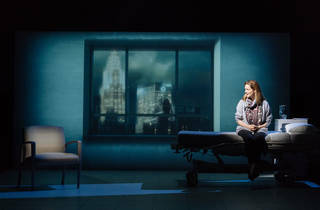 But Broadway veteran Linney delivers a performance blessedly free of bells and whistles, completely ego-free. 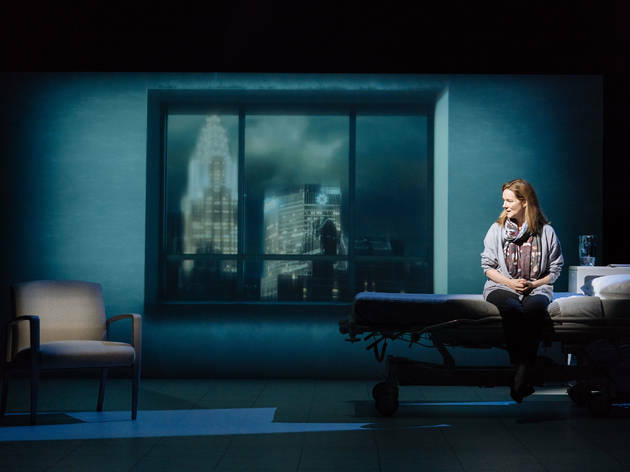 Swathed in a massive, frumpy scarf and coat, she has a raw, emotive, in-the-moment delivery that adds a huge shot of humanity to Strout’s Gordian yarn. And it’s powerful for the sense that her Lucy is holding something back, perhaps to protect herself, perhaps to protect us. It’s a big, intricate performance, but a resolutely human one. 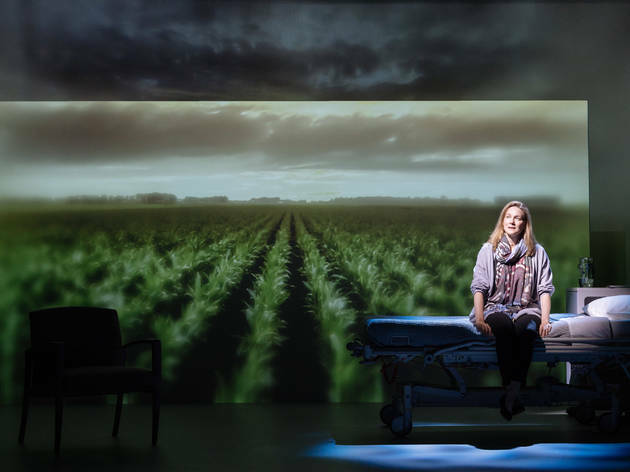 The story, then, concerns Lucy, a woman from small-town Illinois who has moved to New York where she’s uneasily settled down. 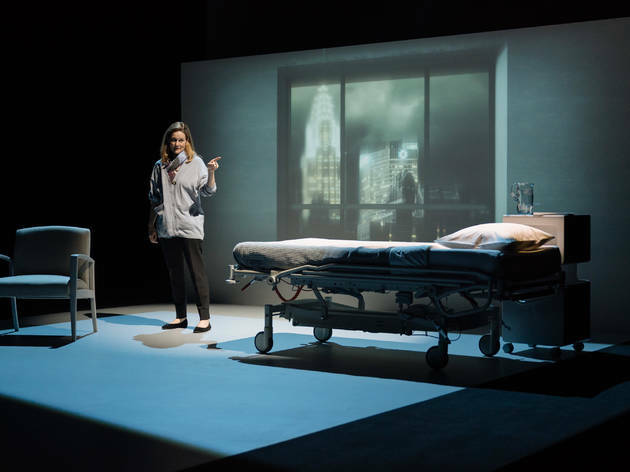 It is the ’80s, and against the backdrop of a city succumbing to Aids, Barton has come down with her own mystery illness that leaves her trapped in a purgatorial hospital for nine weeks. 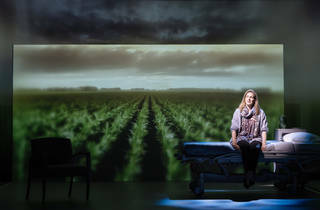 The experience brings her back into contact with her mother, who she’d become distant from after a difficult childhood. The bulk of the monologue is a tangled web of memory, reminiscence and half-unearthed hints of the past. Something dark and unresolved hovers in Barton and her mother’s shared past, something that never springs into focus, and is only alluded to in snatched hints. For the largest part, ‘My Name Is Lucy Barton’ is about a mother and a daughter who can’t talk to each other attempting to express their love; this is practically a genre of fiction for fathers and sons, but feels rarer this way around. Much of it simply consists of accounts of gossip, observations on the hospital and banal reminiscences about Illinois. But a deeper, darker meaning flickers behind the chitchat. I’m actually not convinced Strout’s book is particularly suited to adaptation. Yes, it’s a first-person account, but its literary denseness feels better untangled on the page than chopped and condensed on the stage. The meat of it, concerning the hospital stay, is strong once it finds its tempo, but a final effort to tie up all the loose ends feels rushed and even a little trite. 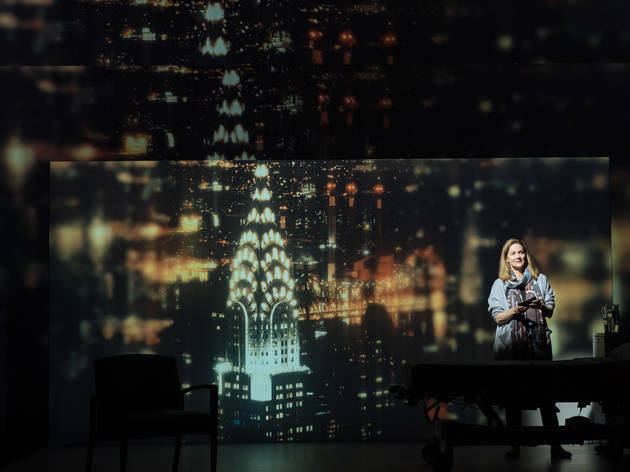 Smart lighting design from Peter Mumford maintains a dynamism and sense of shifting space in Richard Eyre’s brisk production, though I wasn’t really enamoured by Bob Crowley’s cheapo-looking projected backdrops. 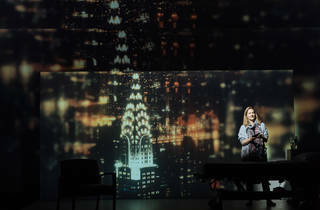 Really, though, it’s all about Linney, and she keeps the show on the road effortlessly. As is often the way with a visiting celebrity, I did daydream a little about what Linney might have done if not this. But it is a privilege to see her in action and you should try and do so in the brief time that she’s here. Stunning. Please arrange an encore, and disregard Mr/Ms Lukowski's review. 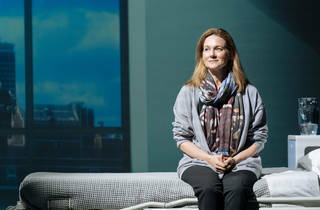 Read the book, and hope that we can see the performance in London again soon.